Lab tests prove that many Windows 7 laptops having a similar price offer better performance than the 2010 MacBook Air models. Recently, after testing two MacBook Air models running Windows 7, we published results that showed the thin and light Apple laptops outperformed most Windows-based netbooks and ultraportable notebooks. Hundreds of readers commented on the article, with many of the comments going something like this: "The MacBook Air costs far more than many of the laptops you've compared it against. How does it do against similarly priced notebooks?" It's a reasonable question, so we went back and did the comparison. (Our results are illustrated in the charts below.) The numbers show that many Windows notebooks that carry a similar price tag outperform the 11-inch and 13-inch MacBook Air models we tested. Other differences show up, too. Many of the better-performing Windows laptops are bigger and heavier than the Air, and some have poorer battery life. But if you're interested in getting the most pop possible for your buck, it's clear that the MacBook Air isn't the best way to go. The PCWorld Labs team used Apple's Boot Camp application to load Windows 7 on new 11-inch and 13-inch MacBook Air models. Then we benchmarked them using our WorldBench 6 test suite and the games Call of Duty 4 and DiRT 2. First, we tested a high-end, $1199 11-inch MacBook Air packing a 1.4GHz Core 2 Duo processor, 2GB of RAM, 128GB of flash storage, and an Nvidia GeForce 320M integrated graphics chipset. The 11-inch Air earned a WorldBench 6 score of 74 and managed to sustain a frame rate of 23 frames per second while running COD4 at 1024-by-768 resolution and high graphics settings. The 13-inch MacBook Air we tested came equipped with a 1.86GHz Core 2 Duo processor, 2GB of RAM, 128GB of flash storage, and the Nvidia GeForce 320M. We paid $1299 for the machine. It scored a 90 on WorldBench 6 and a solid 25 frames per second in Call of Duty 4 at 1024-by-768 resolution and high graphics settings. While the Airs' performance numbers are superior to most of the small Windows notebooks we've tested, they don't compare well against similarly priced, generally larger PC laptops. For about the same price as the 11-inch Air, for instance, you can buy a new Lenovo IdeaPad Y460 with a Core-i5 processor, 4GB of RAM, and a discrete ATI Mobility Radeon HD 5650 graphics card. That system earned a WorldBench 6 score of 106 -- a speed bump you'll definitely notice compared with the Air's score of 74. 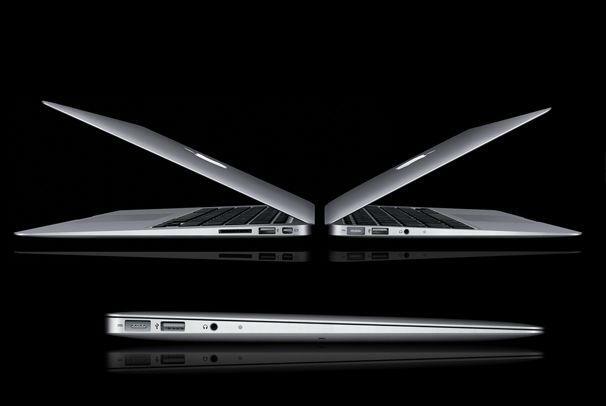 The IdeaPad has a bigger screen at 13 inches, but it also weighs about three pounds more than the 11-inch Air. For ten bucks less than the $1299 we spent for the 13-inch MacBook Air, you could pick up HP's Envy 14. Our review unit of this HP model also earned a WorldBench 6 rating of 106 (versus the 13-inch Air's score of 90), and it packs cool features including ATI's Mobility Radeon HD 5650 GPU, plenty of ports, and even an old-fashioned optical drive (you won't find one of those in an Air) into a slick 5.3-pound chassis. The 13-inch Air does have some advantages, though. At 2.9 pounds, it's lighter, lasts longer on a single charge (6-plus hours compared with the Envy 14's 4.5), and comes with 128GB of flash storage (upgrading the Envy 14 to a 256GB solid-state hard drive, the only SSD choice that HP offers, costs $525). In gaming, no Air can match the Envy 14's excellent result of 61 frames per second running Call Of Duty 4: Modern Warfare at 1024-by-768 resolution under high settings. The 13-inch and 11-inch Air could manage only 25 and 23 frames per second, respectively, in the same test. Another option with superior performance, both overall and in gaming, is the 11-inch, $1299 Alienware M11x with a 1.2GHz Core i7 640UM CPU, 4GB of RAM, and a discrete Nvidia GeForce 335M graphics chipset. It earned a WorldBench 6 score of 91, a negligible difference over the 13-inch Air, but a noticeable improvement over the 11-inch Apple laptop. The M11x smoked the Air in our game tests, managing a steady 41 frames per second running Call Of Duty 4: Modern Warfare at 1024-by-768 resolution at the highest settings thanks to that discrete Nvidia GeForce 335M graphics card governed by Optimus GPU-switching technology. If your priorities in a laptop are good performance with great battery life, other Windows laptops can beat the Air. For example, the $999 Asus U33jc is $300 cheaper than the 13-inch Air and lasts 7-plus hours on a single charge (compared to the Air's 6-plus hours). And the Asus laptop outperformed the Air in our lab, earning a WorldBench 6 score of 103. That kind of performance comes courtesy of a hefty 4.5-pound chassis packing a bigger battery to support an Nvidia GeForce 310M GPU and a 2.4GHz Intel Core i3 370M CPU capable of handling spreadsheets and streaming video with equal aplomb. Neither this comparison nor our previous one is meant to argue that the MacBook Air is inherently better or worse than Windows laptops. That's for individual buyers to decide for themselves (and for readers to fight out in the comments). But this much seems clear from our testing: If you want a reasonable amount of performance in a small package and you don't mind paying for it, the Air's a good choice. If you've got around $1200 to spend and speed is your biggest priority, look to a Windows 7 machine instead.